The Fitbit is a device that is worn on the wrist and used to track activity. At its most basic level, it counts the number of steps a person takes daily. The first Fitbit came on the market in 2007 and sometime after that, I inherited one from my son who had tired of using his. Since many of his friends at work had a Fitbit, he was linked to – and in competition with – all of them through his device. When I inherited the device, I inherited the friends and the competition. Some guy named “Norm,” was always in the lead. From the get go, I wanted to beat Norm! Whenever he walked a little bit more, I walked a little bit more. I was thrilled with the extra exercise this gave me. Worn on the wrist, it replaced my watch and thus I never knew the exact time. The Fitbit strap had a funky latch that was challenging to snap closed. The device also measured the quality of my sleep and whereas I always thought I was a world class sleeper, the Fitbit disagreed which boggled my mind and unsettled my sleep. And then, one sad day, Norm disappeared from the roster of friends. It was at that point that the funky latch on the Fitbit failed me and the device fell off my arm while I was out shopping. When I got home without it, “good riddance!” was my first thought since I don’t need a device to make me feel dumb or to make me doubt my sleeping prowess. But then more years passed and though I continued my daily walks, I found myself a little lethargic and depressed. I wondered if the main perk of the Fitbit – the impetus for extra exercise – could remedy that situation. I brought the topic up with my friends, Vera and Bill. Vera immediately enlisted Bill’s help to research the right activity tracker for me. I stressed that it had to have a built-in watch and that it needed a traditional watch strap. And before I could say that the device absolutely could NOT monitor my sleep, I had the epiphany that I could just take it off at night! Huh! This new device was actually proving my intelligence! Bill took no time in choosing the Fitbit Blaze for me. Plus, he found a much-discounted price on QVC, a company I had never used. I ordered it and received it and though intimidated by this new electronic device, was able to set it up using the directions in the box plus one YouTube video. A thing that I LOVE about the new device is that between the hours of 8 AM and 7 PM, it wants me to walk at least 250 steps per hour and if I have not accomplished this goal by ten minutes before the hour, it vibrates to remind me to get up and go! It’s great, just like when I competed with Norm. In this manner 3000 steps a day are easily mine. Thanks to the internet we all suffer from too much information. This makes buying new things difficult. There’s just too much research that can be done! Therefore, it’s a great idea to enlist the aid of a techy friend in decision making. Additionally, beyond enlisting his aid, I actually took his advice! I didn’t second guess him; nor did I give in to the thought of Googling just a tiny bit on my own. Now that I own the Fitbit, I experience firsthand the fact that endorphins are good for mood elevation and so I am feeling happier. But a second boon to happiness is this: I am a girl who has everything. There is nothing I can buy myself as a reward for exercising, however, I love the fact that the Fitbit goes berserk – flashing and vibrating – when I reach 10,000 steps a day. This bit of positive reinforcement is quite gratifying. And reaching 10,000 steps a day, how hard is that? Surprisingly, not very. Like accumulating anything else in life, the Fitbit proves that a little bit plus a little bit can easily add up to a whole lot. Wow! Who knew that a Fitbit could bring someone so much pleasure? Btw, Bill loved having a project to research. You kept him occupied and out of trouble that day. Of course, now he says he knew a lot about those devices before you asked him, haha! Haha! Love Bill. Love you. Thanks for all the help all the time! I enjoyed your column, as always, Lorie! 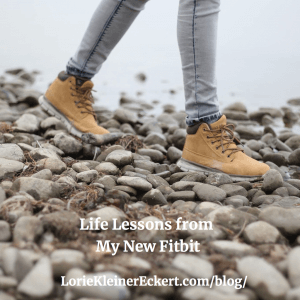 I’m still resisting a Fitbit, as I resist so many things “tech,” but who knows? I may get on this particular bandwagon soon. I’m even considering asking for a Kindle for my birthday. How modern is that?! Hi Rose – I am with friends at a retreat and a few of us wanted to go for a walk. One made us wait until she went and put her fitbit on (why wasn’t she wearing it already??) because she wanted to “get credit” for walking! Wearing a fitbit sure puts a different spin on things. Obviously, I recommend one! !